Shah Rukh Khan is currently shooting in Amsterdam for Imtiaz Ali’s tentatively titled, The Ring. They completed their first shooting schedule in Prague long back. Well, it is known that King Khan has a major international fan following. So when he got down on the streets of Amsterdam to shoot, he was mobbed many times by his fans there. We’ve also seen several pictures and videos of SRK getting surrounded by his admirers on the foreign land. Well, looks like SRK had a very bad experience recently when he was again surrounded by his fans. One of his fans hit the superstar when he was walking towards his car. SRK recently got hit and teased by one of the fans. Well, this did not go well with the superstar so he almost tried fighting back, but was stopped by the guards. 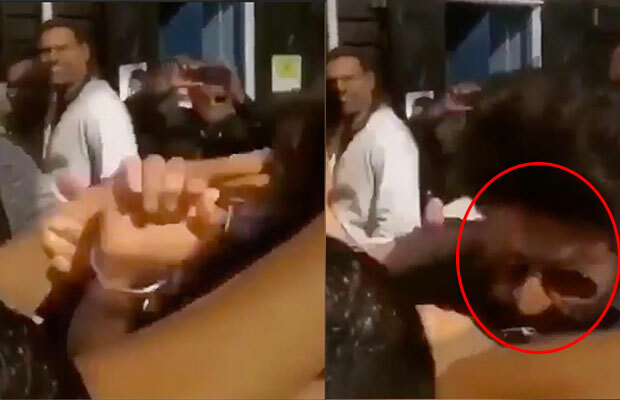 In the video, SRK looks quite calm until someone hits him, and immediately his smiling face turns into an angry one. Well, when the guards came in between, SRK didn’t bother and started clicking selfies with other fans present there. This is quite shocking as SRK always shows his affection and gratefulness towards his fans. We cannot figure out if the fan in the video is a girl or a boy. But, looks like in an attempt to get his favourite actor’s attention, he ended up hurting him. Watch the video and tell us your reactions on the same.